Products from Ideas for the Home by Kenarry™ are now available to purchase at some of your favorite online retailers! Through our brand, Clutter Keeper™, it’s our mission to help you get organized and stay organized through premium, innovative home organization products like our new Deluxe Hanging Gift Wrap Storage Organizer and Deluxe Storage Bags. 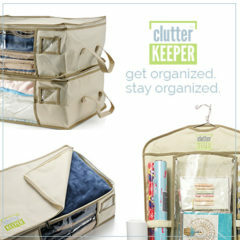 Clutter Keeper focuses on bringing quality home organization products to market that solve real problems for real people. Along with our home organizing products, you’ll find plenty of tips, tricks, and life hacks to help you organize your life and conquer your clutter on our Clutter Keeper website. Loose weave natural burlap ribbon or jute garland is great for DIY craft projects and rustic home decor including burlap wreaths, banners and more. 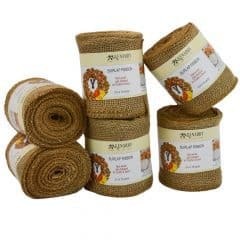 Available in single and multi-packs, each roll of burlap ribbon is 5 inches wide by 10 yards long (30 feet). Multi-pack burlap ribbon is great for crafting in bulk or decorating large spaces and events. Finished sewn edges help reduce or minimize fraying. Use for crafts, DIY holiday decorations, bow making and every day home decor when you want a rustic, shabby chic or modern farmhouse style. The Burlap Table Runner Collection from Ideas for the Home by Kenarry is available on Amazon — it’s perfect to use as every day decor or for all your holiday decorating and entertaining. 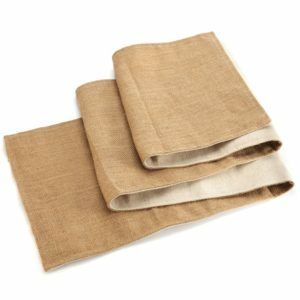 Burlap table runners are a great way to add farmhouse style to buffets, dining tables, entertainment centers and television consoles, coffee tables and more. The collection includes 14″ wide table runners in a variety of lengths to fit any table. Every one of our burlap table runners is lined with fabric and has sewn edges to provide high quality, long lasting durability that won’t unravel before your big event or dinner party. Our beautiful digital art collection and note card sets are hand drawn and showcase whimsical original sayings or designs personally created and hand lettered by Carrie, the creator and founder of Ideas for the Home by Kenarry. Printable Art – Instant download prints are an easy and inexpensive way to get new art to decorate the walls of your home on demand. You’ll have immediate access so you can print now without waiting for your new art to be shipped to you. 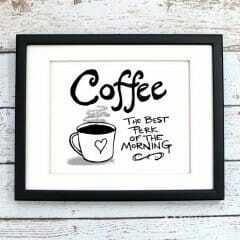 Just add a favorite frame that you already have and you’ve got new decor instantly! Printable Note Cards – The beauty of digital printable note cards is that you buy them once and you have the file to print greeting cards on demand whenever you want. Use them for yourself or print a few sets to create a gift for someone special. Be stylish and casual with shirts for your whole family. Our collection of fun and festive t-shirts is available on Amazon. Each design is digitally created by Carrie from Ideas for the Home by Kenarry. For the Whole Family – The shirts can be ordered in a variety of fits include a classic unisex or men’s size, a fitted women’s version or a pint-sized version for kids (youth sizes 4-12). High Quality – These shirts are lightweight and SO soft. Each shirt is printed on demand by Amazon when you order it and has a double-needle sleeve and bottom hem. Solid colors are 100% cotton. But some of “heather” colors are cotton/polyester blends. 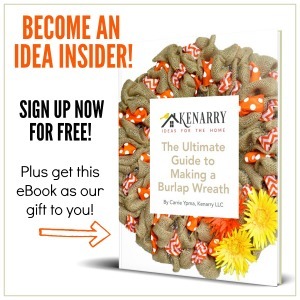 Sign up to become a Kenarry Idea Insider! You’ll get our weekly e-mail newsletter and immediate access to our exclusive Idea Insiders Resource Library stocked with free printables and other resources. You’ll also get special Idea Insider only discounts on Ideas for the Home by Kenarry products — plus you’ll be among the first to know whenever we come out with something new!